Avalon sits enclosed in the Crystal Pavilion on the fringe of Marina Bay. When night fell, the entire place was bathed in sparkling gems! 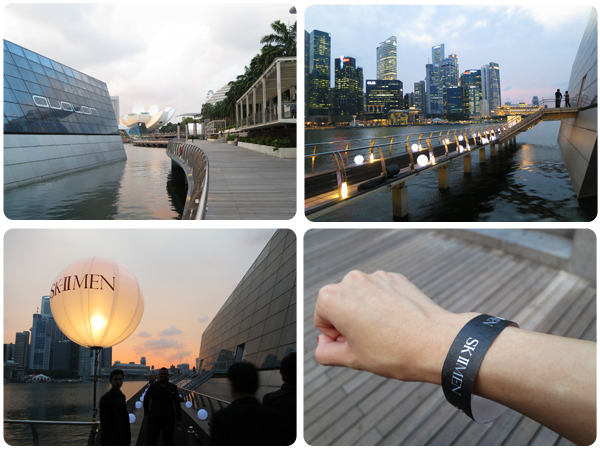 And I got a panoramic view of Singapore's skyline! 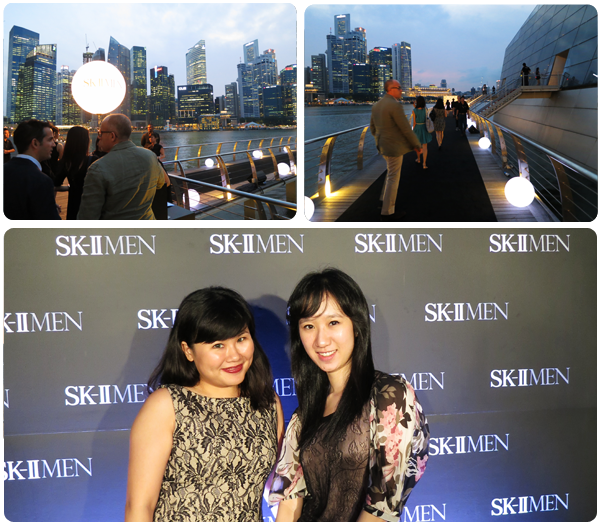 Very befitting for an SK-II event! The focus on the launch of SK-II MEN was, but of course, the Facial Treatment Essence (FTE), designed specially for the males. Formulated with more than 90% Pitera, the iconic FTE promises to transform skin across the 5 dimensions that affect the vibrancy and clarity of men's skin; texture, radiance, spots control, wrinkle resilience and firmness. The SK-II Men line-up also includes the Moisturizing Cleanser and Age Revitalize Moisturizer. "For more than 30 years, SK-II has been bringing the gift of crystal clear skin through the miracle ingredient Pitera that is at the heart of the SK-II brand. After years of research into the characteristics and inner workings of men’s epidermal skin, we are proud to now bring the gift of vibrant clear skin with SK-II MEN. We believe that skin truly is the new measure of a man. It goes beyond the obvious status symbols and speaks to his attention to every detail in his life." Dashing Utt was the host for the day! He is also one of the 3 personalities for SK-II MEN. Celebrities depend on their looks a lot more than the rest of us, so it was only a matter of time when he started borrowing SK-II products from his girlfriend! SK-II MEN sure came at a right time for him (And I believe, many other men as well.)! There was a short segment with Singapore's first SK-II ambassador and supermodel, Sheila Sim! And it also unveiled the face of SK-II MEN, acclaimed Taiwanese-Canadian actor and model, Godfrey Gao! Godfrey started making waves in the fashion world when he was selected to front Louis Vuitton's Spring/Summer 2011 Ready-to-Wear campaign. Since then, he has conquered DKNY, Men's Folio and Nanyou. With his belt of achievements, it was only natural that he was selected to be the face of SK-II MEN. Since embarking on his SK-II MEN journey, he has received nothing but compliments from his friends! He also recommends the brand to his friends who are having skin troubles... Immediately! I had a fab time at the Avalon, learning more about men's beauty tips. Definitely passing them on to the boyfriend! It's good to know that the males are taking care of the skin too. It's part of good hygiene and it means that the males know how to take care of themselves and so, can take care of us too! :P It is also comforting to know that our men are being well taken care of by SK-II! Oilier skin and bigger pores: This is due to men's higher sebum secretion levels that make skin more prone to oiliness. Their sebum secretion levels typically start increasing from their 30s and continue to do so throughout their lifespan. In addition, men’s skin tends to be more acidic and have higher fatty acids, resulting in clogged pores, breakouts and skin ageing signs. Rougher skin texture: This is caused by daily facial shaving, which causes skin irritation and damage to the skin. In addition, men’s skin tends to be less hydrated and hence, less moisturized. Weaker skin barrier function: This is due to the lack of skincare and daily shaving habit which strips men’s skin of moisture. Darker and duller skin tone: With coarse facial hair and the impact of environmental pollutants like UV rays on skin, men tend to have darker and duller skin tone. Texture Refinement: Vibrant clear skin is characterized by a smooth, refined texture with no visible pores on the surface. Spots Control: Vibrant clear skin has an even skin tone devoid of any pigmentation and spots. Radiance Enhancement: Skin that is vibrant clear is marked by a healthy radiance that illuminates skin from the inside-out. Wrinkle Resilience: Resilient to the onset of ageing signs, vibrant clear skin has no visible wrinkles or fine lines. Firmness Power: Vibrant clear skin boasts skin firmness that gives it a sculptured look. Texture refinement: Pitera improves the condition of the stratum corneum by delivering a diversity of skin nutrients that mimic skin’s Natural Moisturizing Factors. Radiance enhancement: Pitera improves skin dullness by activating skin cell renewal, giving skin a health radiance that illuminates skin from the inside-out. Firmness power: By promoting skin cell adhesion, Pitera™ boosts skin’s firmness power and reduces sagging. Spots control Pitera improves melanin conditions by reducing spots and freckles, leaving you with even skin tone. Wrinkle resilience: Rich in amino acids and minerals, Pitera™ softens and reduces fine lines on skin. SK-II MEN is available at Isetan Scotts, Isetan Serangoon, Isetan Katong, Isetan Tampines, Tangs Orchard, Metro Paragon, Robinsons Centrepoint, Robinsons Raffles City, Takashimaya, Senzalus Spa, Travel Retail Nuance Watsons, DFASS and Resorts World Sentosa.